I am enjoying a book by Thomas Thompson, The Messiah Myth: The Near Eastern Roots of Jesus and David. Learn more about his book by reading his essay, Creating Biblical Figures. I have just finished the first chapter, "Historicizing the figure of Jesus, the Messiah." He traces the history of higher criticism of the Jesus tradition and provides a critique of the Jesus Seminar. But it is more than that. He takes on the whole quest of the historical Jesus. As I understand Thompson, Jesus was never intended for the gospel writers to be a person. He is a literary type that carries a tradition. All of the sayings and deeds attributed to Jesus occur in literature centuries before the Gospels were written. Trying to distinguish what might have been from the lips of the historical Jesus from what was placed on his lips misses the point of what the gospel writers were doing. In essence, there is no one home. It would be like separating what proverbs would belong to the historical Solomon or what psalms belong to the historical David or even what words or deeds belong to the historical Moses. In each of these cases, Solomon, David, and Moses are literary figures that carry the tradition. These figures may not have even existed. They function as characters in a parable. Imagine trying to separate the historical words and deeds of Adam from the Adam of Genesis or of King Arthur from the legends about him. I am looking forward to finding out what Thompson says the Gospel writers were doing when they created Jesus the way they did. I am going to get philosophical here. I have been excited about the historical Jesus and the quest. I have enjoyed the different portraits offered by Crossan, Borg, and others. 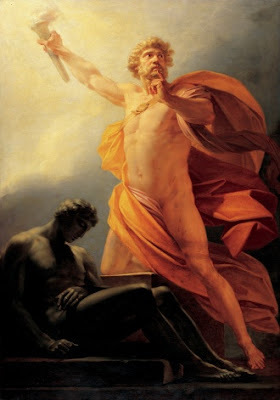 I have much appreciated the work of Westar bringing higher criticism to the public like Prometheus bringing fire from the gods for us lowly mortals. But, I have been thinking about this for some time, and in the end, I am more persuaded by the literary critics than the historical critics. It appears that the Jesus of the canonical gospels is no different in type than that of the non-canonical gospels; in all of them, he is a character in their respective fictions. A question that wants asking is what this means for my faith, or perhaps for the Christian faith. For some time I have accepted that Old Testament characters were fictions including YHWH. But, Jesus, you know. I liked the guy. I liked the new "historical" guy. The guy who championed the poor, told cool parables, ate with the outcasts, and challenged the religious authorities of his day is my kind of fella. I suppose he is a myth as well. He is my myth, though, dammit. I am less and less convinced that there is an historical person behind the gospels. If there is, there appears to be little that we can know about him. But his story, in its various incarnations, still fascinates me. It has a life of its own. Perhaps without intending it (or maybe some of them did), the historical Jesus scholars found their own mythologies. Perhaps that is the essence, if there can be an essence, of literature and of story-making in general. Through retelling them we find our story. I know that some have made the decision to leave church and religion altogether because they became convinced that Jesus is more of a literary figure than an historical one. I don't think a person must make that choice, though I respect those who do. I like the fact that the authors created Jesus from the stories available to them and in turn created their own story of faith and meaning. I wonder if that may be our task today. Hey, excellent post. I've been reading your blog for years, and I just wanted to let you know I appreciate it. I'm an undergraduate studying Theology at Wheaton College (IL) and I'm fascinated by the historical and literary critics of Jesus. Wheaton is an extremely conservative place, so it's been refreshing to have this place online to hear the opinions of like-minded folks. Thanks for all your work! If you are going to go down this path then you have to go all the way. The text of the Gospels are finely crafted vessels that carry a highly valuable balm. If you break the vessel, then what are you going to use to carry the balm? Say the gospel writers are not interested in historical detail as you and I know it. They are also not interested in myth making as you and I know it either. They are much more likely using the tools they have and the stories they know as an alphabet, or a vocabulary, to try and tell you something new. They called what they were trying to tell you "good news". What is that "news" and what makes it "good"? What new thing do they know? What new reality are they living as they tell their story? When we translate a story, we are going to find that it is not enough to merely translate from one way to pronounce words to another. The language a culture speaks uses its own popular sayings, its own mythology, and its own cosmology as an alphabet. The alphabet is man made. It always is. But just because the language is man made does not mean the message is false, or even man made. Take calculus for example. Newton invented it to explain the motion of the planets. But calculus is just a man made language. Without the language I can't explain how the moon stays in the sky, but it stays there all the same. It sounds to me that you tend to confuse the vessel with its contents. If you do that, you will be making the same mistake that the Fundamentalists make. Me, I like the vessel we have. I love to view its lines and curves, and how it preserves its contents. Come up with a new one and I will give it a fair shake too. But at the end of the day, its really all about the contents. Note to readers: I hope none of you would confuse my philosophizing with the work of the Jesus Seminar or Thompson. Just my ramblings. Thank you. So glad you are reading here and that you commented today! All the best at Wheaton! Thanks for your post. I reread I Corinthians 15 yesterday and was wondering how you felt about this chapter. Your post gives me this opportunity to ask. If Jesus was a myth, this verse becomes problematic. Paul has given a verifyable test for the resurection: a multitude of eye witnesses. So, this verse says Jesus was resurrected or that someone is being purposefully deceptive. If this is true, then we cannot trust this verse and chapter, and probably the whole letter. What is the explanation of who is doing the deceiving and what evidence is available? The rhetorical question that Paul asks in verse 32: If the dead are not raised, "Let us eat and drink, for tomorrow we die" becomes a serious question. John, do you believe the dead are raised, and, if not, why not "eat and dring"? If you are going to go down this path then you have to go all the way. What path do you mean? The text of the Gospels are finely crafted vessels that carry a highly valuable balm. If you break the vessel, then what are you going to use to carry the balm? I don't want to break any vessels. I am not exactly sure what you are saying, but let me see. I think your concern is that taking the figure of Jesus and making a new myth about him outside of how he is portrayed in the Bible is not a helpful plan. Is that what you are saying? If that is what you are saying, I have a couple of responses. One is that I agree. No one would think it swell to rewrite Shakespeare's plays or to separate the historical from the literary Hamlet. In this sense, leave the Bible alone and let it stand as a work of art like Shakespeare's works. Read it or not; appreciate it or not; understand it, but don't try to pull out its characters and write new stories about them. I can see the benefits of that approach. On the other hand, the Bible has a different function for us than Shakespeare as does Jesus as opposed to Hamlet. Even so, when Shakespeare is performed, the performance is often about the present. The performance highlights or emphasizes something in the play for the present audience. Costuming and setting all play a part as do the actors' interpretations. Historical study will also shape the play. Current social issues may shape the play (ie. making one of the characters gay or something). Perhaps Christian worship is similar. We take the stock characters (ie. Jesus) and in telling the story re-create him for the present. I don't think that is messing up the contents or the vessel although some may disagree. You said "I like the fact that the authors created Jesus from the stories available to them and in turn created their own story of faith and meaning"
Yes they each had a spin, but I think its more likely the authors >>told<< Jesus from the stories available to them, and it is >>we<< who create a Jesus from their stories when we marry them with our own stories of faith and meaning. Part of the current controversy is this battle over recognizing that this is what we do, that it is unavoidable that we do so, and that it is OK that we do so. It seems there are whole branches of Christianity that think they do not modify the story, sometimes significantly, in their own reading and living of it. Pursuing the historical Jesus, or the objective reality behind the gospel story, or even the original text as it was first put down in writing, becomes a search for the Holy Grail. But what would we find if we found it? The Holy Grail is, and always was, only a vessel. Jesus may have said "drink this cup", but it is the wine that we should drink, not this cup or that. Still, we have a cup, it carries a wine, and to some extent, the wine sanctifies the cup. I think sometimes some authors get too much pleasure out of smashing cups while showing too little appreciation for the wine. We need to be sensitive to that. Thanks. Your comment was timely. I decided to use 1 Corinthians 15 as my text for Sunday as I am working through Paul on our Bible, cover to cover series. 1) try to figure out what Paul meant and what was at stake for him and what the alternatives were and what he meant by having Christ appear to him as well as what resurrection meant for him. 2) try to think about what resurrection means for us. I think sometimes some authors get too much pleasure out of smashing cups while showing too little appreciation for the wine. We need to be sensitive to that. I suppose that is true. What was it Mel Brooks said when he was asked about critics? ...Oh, I thought you said 'crickets." I think Thompson's approach is one in which honors the authors and seeks to understand where they are coming from. I would say the same for the historical Jesus folks, too. Seeking understanding is the role of criticism. But someone will ask, ‘How are the dead raised? With what kind of body do they come?’ Fool! I love it! Paul does everything short of coming right out saying, "It's a metaphor! It's symbolic. Aren't you paying attention?!?!" "After that, he appeared to more than five hundred of the brothers at the same time, most of whom are still living, though some have fallen asleep." This is a very good post because it elegantly captures a profound difference in perception and understanding between some of us, and others of us. The gem is the term "verifyable test." For me, the use of the term in this context is completely and utterly inappropriate. Under no circumstances in my world are Paul's words evidence of something verifiable, or even close to it. I live in a world of data, facts, hypothesis testing and proofs. I live in a world of physical realities and their measures. Verifiable means clear physical evidence, and this verse isn't it. However, for others "verifiability" has entirely different standards. I don't understand this. At times I find it annoying and stupid, and potentially dangerous. I cannot conceive how this concept of verfiability occurs without turning off that part of the brain that deals with analysis. If one believes this verse represents a verifiable test, what other surprising conclusions can be made? But, there it is. And so many American seems happy with such understanding. This statement: So, this verse says Jesus was resurrected or that someone is being purposefully deceptive, is factually incorrect, and bereft of logic. The verse doesn't say that Jesus was resurrected, it says that the Bible says that Paul claims that Jesus appeared to 500. We don't know for a fact that Paul said such a thing. And even if he did, we don't know if Paul was telling the truth in the literal sense, or whether he was speaking symbolically. The verse doesn't say that any of the 500 actually saw Jesus, or even if they did that they recognized what they were seeing. There are layers and layers of supposition so thick that no verifiability can possibly exist. Yet for some, this verse constitutes absolute proof of a fact. I just don't get it. Paul, how can we bridge this gap? You wrote: Paul, how can we bridge this gap? I don't think we can. Unless I was not clear. When I said "verifiable", you may have thought I meant for us, living today. I meant for the people reading Paul's letter at the time. The ability to talk to eyewitnesses in Paul's letter is an astounding claim. If someone doubted the resurrection, there were people that were alive that were eyewitnesses. For verifiability, if someone were to have taken to Paul to a court of law to prove the resurrection, he claims that there are hundreds of witnesses. If this is not true, this is a bold deception. If it was true, and you were sitting on the jury seeing hundreds of eye witnesses, would you decide that Paul's claim was not verifiable? You should send your next application to Debunking Christianity. You'd be a great contributor there. if someone were to have taken to Paul to a court of law to prove the resurrection, he claims that there are hundreds of witnesses. Whose court room? A 21st century American court room? What is resurrection and how does one "prove it?" Fred at Rev's Rumbles published a post about this post. I made a comment over there that I am repeating here. This is for me, really, as I think through this. I think most people (progressives or liberals especially) have believed that the gospels are exaggerated or fictionalized accounts of a real person. There may be some history and some fiction and we may go back and forth on how much is which. I have generally held to that view. This is the view of the Jesus Seminar and other NT scholars. Even conservative scholars acknowledge some fabrication or exaggeration. Thompson (and others) are taking this in a new direction. I have resisted this for a long time. I still do at the emotional level. If Thompson is correct regarding what these gospels are, I have to rethink some things. It requires of me a shift of faith. Faith not in a figure (whether that figure is Jesus the human or Jesus the god) but faith in the message of the narrative itself. Jesus in this view, becomes a parable for "God" if you wish. This of course requires me to ask what is the message that I am invited to put my trust? I don't insist. I am trying to be honest and work it out is all. I thought you meant for us. That's what is sounded like to me. I missed the part about the 500 being available. I only got the part that (supposedly) Paul makes the claim that they existed. That's way, way too many ifs for me. But, if Paul was speaking symbolically, metaphorically, using 'night language', I'd say OK.